When Judah turned away from God he allowed the enemy nation of Babylon to capture the Jews and take them away to Babylon. The temple and the city walls of Jerusalem were destroyed. King Nebuchadnezzar of Babylon commanded that the brightest and most handsome captives be educated and taught to serve in the Babylonian courts. When Daniel and four other young Jews were told to eat the king’s food they refused because it was food that God had forbidden Jews to eat. When the officials saw that these young men were healthier and stronger when they obeyed God’s food laws, they allowed them to continue obeying the Lord. These four young men impressed the king because they were smarter than all the men in the king’s court. Jehoiakim was still king of Judah when Daniel and others were taken captive by the king of Babylon in 605 BC. During Daniel’s first years in Babylon, things did not get better back in Judah. Daniel and his friends watched as many other Jews eventually joined them in this foreign city. When Jehoiakim died, his son, Jehoiachin, was king for only 3 months when Babylon’s King, Nebuchadnezzar, attacked Jerusalem. Jehoiachin and 10,000 of the most prominent Jews were taken to Babylon. Jehoiachin’s 21-year-old uncle on the throne by Nebuchadnezzar and his name was changed to Zedekiah. Two other captives whom we will hear about later were taken at the same time as Jehoiachin. These were Ezekiel and a cousin of the yet-to-be born Esther (Mordecai) – Esther 2:6. This second deportation was in 597 BC. Eventually, Zedekiah rebelled against Babylon and the great city of Jerusalem finally fell (2 Kings 25). Zedekiah was cruelly made to watch the execution of his sons and then his eyes were put out. Priests were slaughtered and the temple destroyed. Jerusalem was left in ruins and the final captives were taken to Babylon. This happened in 586 BC. Background Information on the Divided Kingdom. Meanwhile, Daniel and the Jewish captives in Babylon had to make the best of their new lives. Daniel and other young men were chosen to live at the palace and be educated. Nebuchadnezzar had conquered many nations besides Judah, and he was gathering the best brains from all of them to be trained as helpers in his government. The king planned a 3-year course of study for these young men. Daniel had the opportunity to acquire the best possible education of the day. The Babylonians had knowledge of math and astronomy, as well as medicine. Chemistry and metallurgy were established sciences of Daniel’s time; theology and philosophy would also have been included. The man in charge of the students gave them Babylonian names. “Daniel” was Hebrew for “my judge is God”. His new name, “Belteshazzar” meant “protect his life” and honoured a Babylonian god. He ordered for them what he thought was the very best of food and drink. The food and wine assigned to the young men from the king’s table were probably very rich, luxurious, rare foods that only the wealthy could afford. But the problem with the king’s food and wine was that it had all been involved in worship ceremonies to heathen idols, and anyone who ate it was honouring the idol. Also, God had given the Hebrews strict laws about food. Pork and some other kinds of meat were not to be used at all, and when cattle or sheep were killed, the blood was to be carefully drained from them. These rules were not followed in Babylon. Daniel felt he would be defiled if he did not keep God’s laws. The man in charge of the young scholars considered Daniel’s refusal to eat the king’s food. However, the man was afraid to disobey the king. What if he gave the Hebrew boys some other kind of food, and then they were not so strong and handsome as the rest of the students? Then the king might be angry and cut off the head of the man who disobeyed him. Daniel suggested a ten-day test. The Hebrew boys would eat vegetables and drink water instead of sharing the king’s food and wine. The man agreed to try it. If the boys became weaker in ten days, then he would insist that they eat what the king ordered. The test proved that the Hebrew’s diet was best, so it was continued. God wanted these Hebrew boys to be His witnesses in Babylon. He helped them become the best of the students. To Daniel, He gave a special ability to understand the messages that He sometimes gave in dreams. The king himself gave the final examination at the end of the three years of training. He found that the Hebrew boys not only were the best of the students, but also were even wiser than the great scholars of Babylon. Daniel stayed in Babylon the rest of his life. He grew to be an old man in Babylon. Daniel knew that his body was a gift from God. He wanted to take care of it and follow God’s instructions. The New Testament does not contain specific food commands. Still, the principal of caring for the bodies that God gave us makes sense. 1 Corinthians 6:19-20 talks about the fact that our body is a temple for Holy Spirit. We are to honour God with our bodies. Bring some healthy and yummy food to class today. As you share the food with the children discuss the importance of a healthy diet. Talk about the fact that there were rules about food in the Old Testament. Jews were not allowed to eat some things (like pork). Think of reasons why God had rules about food (health, cleanliness, no refrigerators, etc.) In today’s story we are going to learn about a young boy who always tried to obey God’s laws about special foods. God warned his people over and over – if they did not obey him then he would not protect them from their enemies. One of the enemies was King Nebuchadnezzar, ruler of the powerful country of Babylon. King Nebuchadnezzar wanted to destroy the special city of Jerusalem and destroy the beautiful temple of God. Because the kings and many of the people did not obey God – he let King Nebuchadnezzar win. King Nebuchadnezzar came to Jerusalem three times. The first time he took many people as prisoners including many young people. The second time he captured the King and army and took 10,000 people as prisoners. Finally, on the third capture King Nebuchadnezzar broke down the temple and destroyed the city of Jerusalem. He took away almost all the rest of the people. They all had to move to the city of Babylon. Now, God’s people could not live in their own country. Bad things had happened because most of the people had chosen not to obey God. Not all the people were bad. There were four good young Jewish boys who were taken as prisoners during the first capture. Their names were Daniel, Hananiah, Mishael and Azariah. They were good boys who loved God. They obeyed God’s laws. They worshipped God and prayed. They were also careful to obey all of God’s rules about which foods they could eat and which foods they could not eat. Now they were prisoners! They had to leave their parents and go live far away in the city of Babylon. While these boys were living in Babylon, King Nebuchadnezzar decided to choose all the smartest and healthiest young prisoners to be his special helpers. Daniel and his three friends were chosen. The king wanted the prisoners to learn to like Babylon and to help the king. They were taken to the palace and taught all the laws of Babylon. Their names were changed to Babylonian names – Belteshazzar, Shadrach, Meshach and Abednego. They learned science and maths and all about the stars. While the boys were learning, the king put an official in charge of them. He told the official to give the young men the best food in Babylon. There was one very big problem. Daniel and his friends knew that the king’s food was food that God did not allow. The food had probably even been used in the worship of idols. If they ate the food then they would be disobeying God’s law. 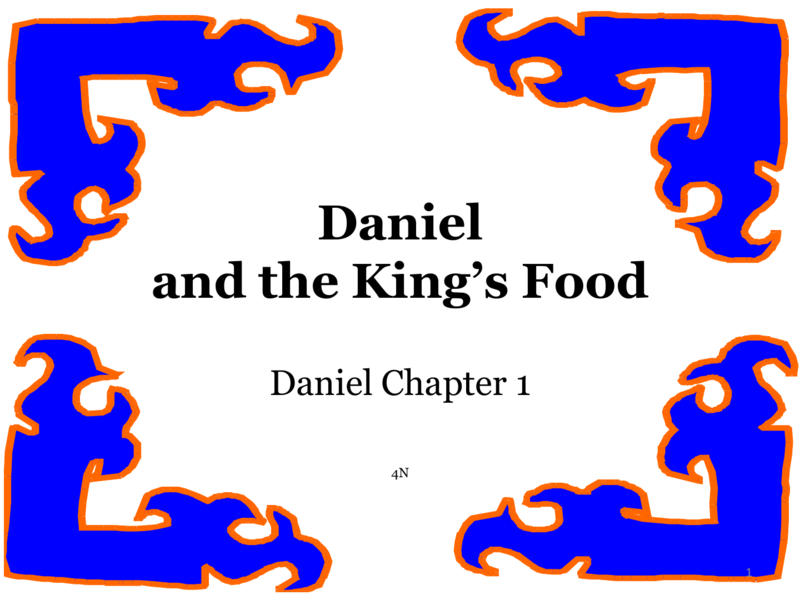 Daniel told the king’s official that they would not eat the king’s food. The official liked Daniel and his friends. He noticed that they were good boys and always tried their best. He did not want to make them eat the king’s food but he was afraid that the king would get mad at him. Daniel had a good idea. He told the official to perform a test. Daniel and his friends would only eat vegetables and drink water for ten days. At the end of ten days the official could judge to see if they were as healthy as all of the other young men at the palace. Daniel and the other three boys ate only healthy vegetables and drank only water for ten days. At the end of ten days the official noticed that these four boys were healthier than all of the rest of the young men at the palace. From then on he allowed them to eat the food that God allowed. They did not have to eat the king’s food. At the end of the study time all of the young men were brought before the king so he could test them with questions. The king decided that Daniel and his friends were the best of all the young men in the palace. They were wise and intelligent. They were ten times better than all the magicians and wise men in the entire kingdom. Daniel, Shadrach, Meshach and Abednego became wise men of the king’s court. They always loved God and tried to obey his laws. Even though they were prisoners God blessed them and took care of them. What happened to Jerusalem after the kings all stopped obeying God? It was destroyed and the people taken captive. How did the boys do when King Nebuchadnezzar tested them with questions? They were ten times smarter than all the wise men in the kingdom. Visual Aids: Try telling the story using one of the following free visual aids. The first works well for showing on a computer, laptop or tablet. The first one is a smaller fuile size for printing. Make and eat some healthy snacks in class today. Do some exercise for your health. You might even try an exercise tape or take a walk. Click here for ideas to help children memorise Scripture. Make a poster depicting 1 Corinthians 6:19-20. Cut and paste pictures from magazines depicting people exercising and eating healthy food. Make a poster about saying “no” to drugs. Discuss the harm that alcohol and other drugs can have on our bodies. Study this before class so that you will better know what you are talking about. There are a number of resources online and from local programs at schools. Various Daniel worksheets. Available at http://gonnafly.squidoo.com/ Once on the webpage you will need to scroll down to the Daniel worksheets.